The stars of the hit CBeebies animated series Q Pootle 5 will celebrate Christmas with an exclusive, never before seen episode. The 27 minute Christmas Special released on DVD on 17 November 2014, courtesy of Proper Distribution. 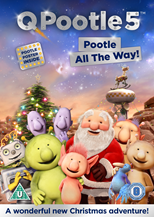 To celebrate the release I am offering you the chance to win one copy of the brand new DVD Q Pootle 5 Christmas Special: Pootle All The Way. So if you have a little CBeebies and Q Pootle 5 fan in the house, or know one who is, here is a must-have adventure for this season. For a chance to win a copy of the Q Pootle 5 Christmas Special DVD, just enter my giveaway through the Rafflecopter widget below. Good luck! And have a lovely Christmas. Disclaimer: I am running this competition on behalf of the Q Pootle 5 Team. I have not received any compensation to do so. Great prize for young ones to get them in the Christmas spirit. We love the show so will enter for my toddler! I've just started noticing this on CBeebies. I love Christmas episodes. I've never heard of this, but we don't have TV so I guess I wouldn't have! I have never seen this show but the characters look very cute. My son is a bit big for pootles but they seem like cute cartoon characters. I'm sure he would have loved them a couple of years ago.